The ambitious Rainbow Bend project (pdf), completed in 2013, took place in stages over 10 years, involved a diverse set of funding sources, and provided both flood risk reduction and salmon habitat restoration along the Cedar River (see video). Large-scale restoration projects are often only possible following land acquisition, which requires a committed effort and significant resources. The Lake Washington/Cedar/Sammamish Watershed Chinook Salmon Conservation Plan (WRIA 8 Plan) offers a comprehensive set of recommendations for protecting and restoring salmon habitat throughout the watershed. It is an ambitious document, developed by watershed partners after Chinook salmon were listed as threatened under the Endangered Species Act (ESA) in 1999. After being adopted by 27 local governments in 2005, the plan was approved by NOAA Fisheries in January 2007 as a local chapter of the Puget Sound Salmon Recovery Plan. 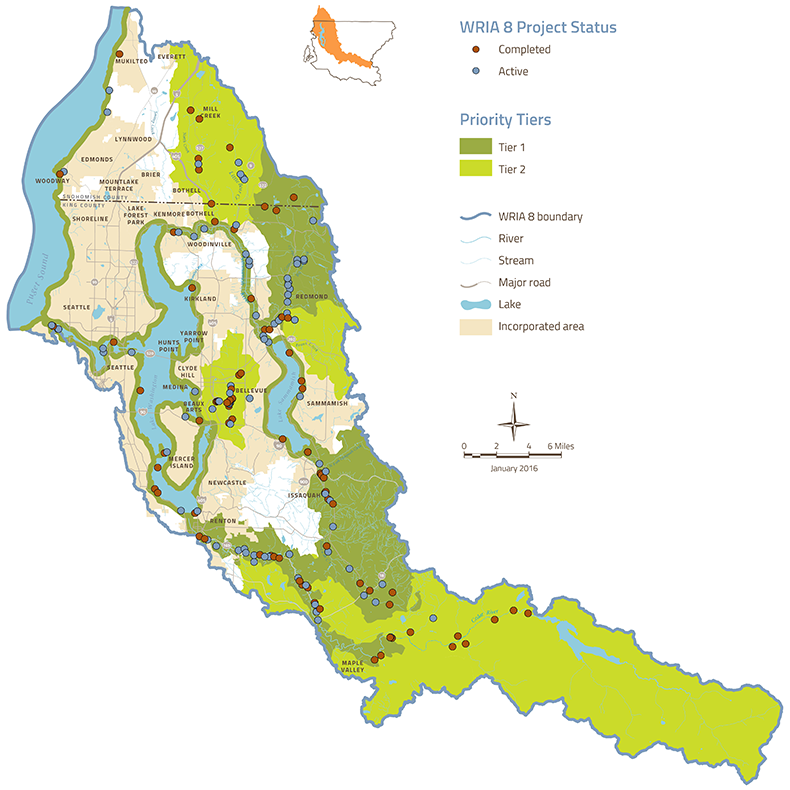 The WRIA 8 Plan's recommendations focus on habitat protection and restoration, land use and planning, and outreach and education. The WRIA 8 Plan was created with input from numerous stakeholders and provides a science-based roadmap for protecting and restoring spawning, rearing, and migratory habitat for Chinook salmon. Local governments, tribes, and other partners had already been leading habitat protection and restoration efforts for many years; adopting the WRIA 8 Plan in 2005 established shared priorities for preventing further decline of Chinook habitat and restoring degraded habitat across the watershed. The full list of restoration and protection projects in the WRIA 8 Plan is referred to as the Comprehensive List, comprising nearly 600 actions throughout the watershed considered necessary to achieve recovery in the long term. Projects include physical restoration (targeting instream, riparian, and floodplain processes), as well as property acquisition to protect functioning habitat and enable future restoration. In many cases, especially along the Cedar River and larger stream systems, acquisition can help meet other objectives—including flood risk reduction and enhancing resilience to climate change. To protect and restore the habitat necessary for salmon recovery in WRIA 8, the Plan set an ambitious funding goal of securing over $17 million annually from federal, state, and local sources. This goal assumed 2005 spending levels from these sources would not only continue, but would increase to bolster our ability to implement recovery actions. Project implementation has focused on the Start List, a subset of actions from the Comprehensive List intended to provide focus for the first 10 years of project work. The Start List is a living list and is regularly updated to reflect changes in project status and add projects that are ready to advance. Currently the list contains 200 projects. Of these, 48—or 24%—are complete, 33% are either underway or partly complete, and 19% are proposed for implementation (see pie chart above). 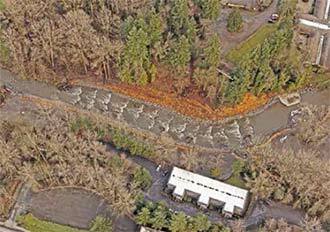 The City of Issaquah and the Washington Department of Fish and Wildlife worked together to remove a deteriorating diversion dam (pdf) from Issaquah Creek in 2013. Built in the 1930's to supply water to the Issaquah Salmon Hatchery, the dam blocked salmon access to eleven miles of high quality habitat. The project replaced the dam with a series of rock weirs, and included streamside plantings, placement of woody debris, and construction of a new fish-friendly water intake for the hatchery. Tracking implementation of projects from the Start List does not tell the full story of WRIA 8 Plan implementation, however. Watershed partners have also completed an additional 40 actions from the Comprehensive List, bringing the total number of projects implemented from the WRIA 8 Plan to 88 (69 restoration projects and 19 acquisition projects). Another 25 projects on the Comprehensive List are actively moving toward implementation. 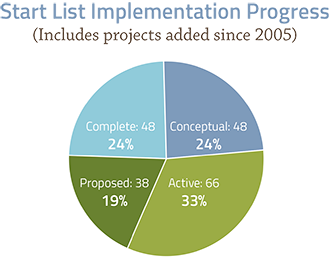 Combined with the active projects from the Start List, 17% of nearly 600 Comprehensive List projects are actively moving toward implementation. In general, implementation of Chinook recovery projects in WRIA 8 has proceeded more slowly than envisioned when the WRIA 8 Plan was adopted, largely due to inadequate funding, reduced capacity among partners to develop and prepare projects for implementation, and the complexities of implementing habitat protection and restoration projects—especially in an urbanized watershed. Nevertheless, WRIA 8 partners continue to make progress toward the watershed's habitat restoration and protection objectives, improving conditions for Chinook and other salmon species. In the early years of plan implementation, WRIA 8 partners focused on acquiring land to protect existing high quality habitat. Ten years later, property acquisition is still a priority, but is now focused on acquiring streamside parcels to facilitate restoration projects that reconnect rivers and streams to the floodplain. Floodplain reconnection provides important off-channel habitat for juvenile Chinook salmon looking for food and places to rest, and is one of the most important salmon recovery actions identified in the WRIA 8 Plan. Acquisitions have enabled significant progress on large-scale restoration activities in recent years that will offer enhanced rearing opportunities for young salmon within the watershed. Since 2000, WRIA 8 has worked with the Army Corps of Engineers to make temporary infrastructure and operational improvements to improve fish passage at the Hiram M Chittenden (a.k.a. Ballard) Locks (pdf). In 2003, Seattle Public Utilities enabled Chinook to pass above the Landsburg Diversion Dam into the upper reaches of the Cedar River, making available more than 17 miles of high quality habitat. In 2012, Adopt A Stream Foundation and the City of Woodinville removed culverts on Little Bear Creek (pdf) that improved salmon access to 32 miles of upstream habitat. In 2013, the City of Issaquah and Washington Department of Fish and Wildlife removed the Issaquah Hatchery Intake Diversion Dam, opening up over 11 miles of high quality spawning habitat in upper Issaquah C reek.